How to make a (good-looking) spherical panorama on indoor places ? Such as breezeways, corridors, rooms, and any indoor place with limited height, which is approx. 3 meters. How to make spherical (360) panoramic image with 2:1 aspect ratio? by rotating SLR 360 degrees horizontally first, then repeat from 0 degree, for each 30 or 45 degree, record upside and downside. Then take the recordings to Ms ICE, the program automatically create 360 spherical panoramic image. This works perfectly fine for outdoor environments, please look at the result here. Also the process is long and burdensome. Additional question: Please let me know if there are more better tools / softwares / methods to generate this panorama. The problem you are encountering is caused by the fact that the point of view is moving. In large, outdoor shots, the distance between you and the subject is far, thus, slight changes in the point of view don't matter relative to the distance to the subjects and the image looks fine. When you are in a confined space however, the difference in distance becomes too large and angles obviously don't match anymore. To account for this, you need to avoid moving the point of view. This is a relatively hard thing to do as the center point of the entry to the lens needs to remain constant. The easiest way to do this is to get a panoramic head for a tripod that will allow you to pivot around the center point of the front element of the lens. These tend to be a bit (a lot) pricy though. Fish eyes will likely not produce better panoramas. The best results actually come from using a telephoto lens and taking more photos. You want the least barrel distortion possible to make angles match up close to the angles of the next photo over. Think about it like trying to make a sphere, the best quality look is going to be a really big sphere made of lots of little squares, but this is also the most time consuming to do. This is also basically the principal of trying to do it from video frames though as they are each a small image capturing a little square of the scene. 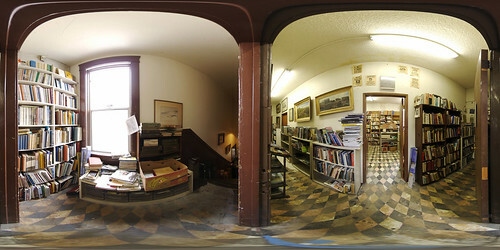 You'll want to see this question: How are virtual tour photos taken? The tools I use for doing indoor spherical panos is a tripod, a Nodal Ninja 3 panohead, calibrated for my particular camera/lens combination. The lenses I use are a Sigma 8mm f/3.5 EX DG circular fisheye and a Rokinon (Samyang) 7.5mm f/3.5 (diagonal) fisheye for micro four-thirds. If you're shooting without a panohead, you are very likely introducing parallax which causes objects to move relative to each other between member images, and no amount of warping can result in a clean stitch. You must rotate the lens around the no-parallax point. If you cannot afford a panohead and tripod, you could try doing it handheld with a plumbline (or philopod), but without a fisheye lens to give you extreme coverage, the number of images you'll have to shoot for full coverage are going to make it tough. Most ultrawide lenses will still require two or three rows+zenith and nadir for full coverage. The Sigma 8mm circular means you can cover an entire sphere handheld with only four portrait frames. You will also want a stitcher that gives you more control than ICE does over the final stitch. It's very difficult to correct mis-stitches in ICE, since all the guts of how the stitcher is matching up the image are hidden from you. PTGui is the application I use (much better masking tools and includes viewpoint correction for nadir patching, which is invaluable to me), but if you can't afford it, Hugin is a great open source alternative. Not the answer you're looking for? Browse other questions tagged indoor 360-panorama or ask your own question. How to properly capture photos for merging? 360° (spherical) panorama with person / portrait? How do you avoid showing the tripod in 360º (spherical) panorama photography? 360° Spherical Panorama using 4 camera on the edges of a car possible? How do you explain to an inexperienced person how to take photos for you to make a panorama?